Last week I shared how most publishers are realizing just a fraction of their potential audience because they lack a social distribution strategy, and showed which topics are most likely to be shared by connected audiences. But is topic the only aspect of content that influences sharing? Could articles with topics as disparate as gardening and bull fighting share some other characteristic that would make them both go viral? The Journal of Marketing Research published the study What Makes Online Content Viral? in 2011 to appease inquiring minds. Researchers analyzed 7,000 New York Times articles over 2 months to determine what factors made an article more likely to earn a place on the Times’ “most-emailed” list. 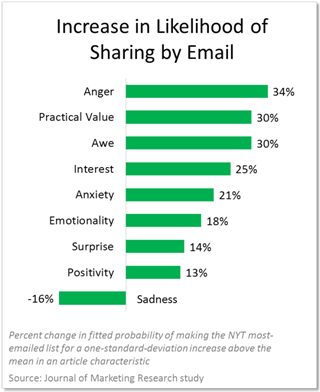 But wait a minute…are the factors that predict email sharing the same as those that predict Facebook or Twitter sharing? Here’s where we run into the difference between broadcasting and “narrowcasting.” Remember that purple rash I mentioned last week? I’ll email that WebMD article to my significant other (anxiety! practical value!) but I most certainly won’t tweet about it. 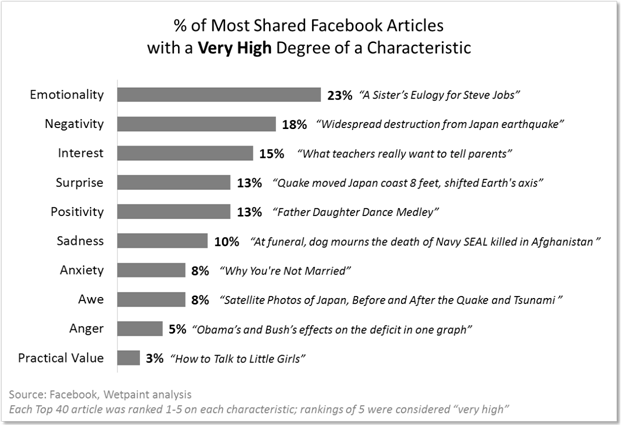 I looked again at the Most Shared Articles on Facebook in 2011 to see which of the study’s findings held up on the social networking stage. Sound familiar? It mirrors the formula for success that Nieman Lab found Buzzfeed using to achieve record results. And, notably, practical value, the #2 driver of email virality, falls all the way down to the bottom of the list on Facebook. Before you go and replace all of your content with funny baby videos and Justin Bieber songs, remember that this isn’t about sacrificing the integrity of content for traffic. It doesn’t work that way. This is about engaging readers on the most important axis of all: the axis of significance. Emotional content helps us connect with friends online in a deeper way than a how-to video might. “The future is going to be about combining informational content with social and emotional content,” says Jonah Peretti (founder of Buzzfeed). We all have a powerful emotional drive to live a great life, and getting there means knowing how to be healthy, how to fix a leaky faucet and how to maintain successful relationships. Oprah’s tagline “Live Your Best Life” is a beautiful example – no one is better at linking home décor and health advice to something far greater and more aspirational. Publishers in the midst of developing a social distribution strategy (especially those of us not lucky enough to traffic in Bieber songs) will be wise to follow her lead. please do write more on this fascinating subject! I think there’s a point where the science of technology ends and the art of content begins. I’m grateful to the world’s artists, journalists, editors, and creatives who do their best to get the ‘wow’ connection every day. The technology helps with distribution, but you’re right – personal connections are made between people, not screens.